My book: A Nobody in a Somebody World; My Hollywood Life in Beverly Hills is officially released! I’ll be telling some fun stories about the wonderful people I’ve met and experiences I’ve had. Okay…maybe some that were not so wonderful, at times bawdy, but many that were LOL humorous. 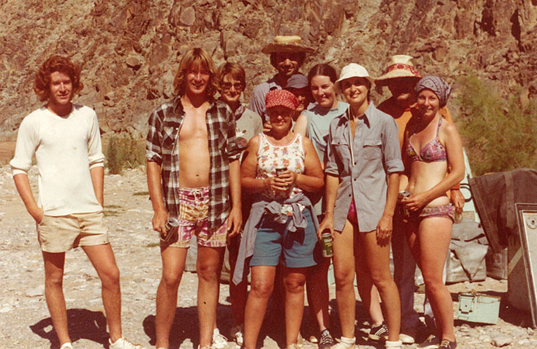 (Left) The famous Grand Canyon Rafting trip; August, 1976. The photo appeared in Woman’s Day magazine in 1991. Starting at the left (front row) is Matt Bombeck, his brother Andy, then “Mom” Erma and me (in white hat). Sis Betsy Bombeck is peeking over my right shoulder and “Dad” Bill is in the back right with that stupid ribbon on his straw hat. A Nobody in a Somebody World is dedicated to Erma with the eulogy I gave at her funeral about our near-death, yet hilarious, experience hiking down the Bright Angel Trail to meet the river rafts at the bottom of the Grand Canyon. 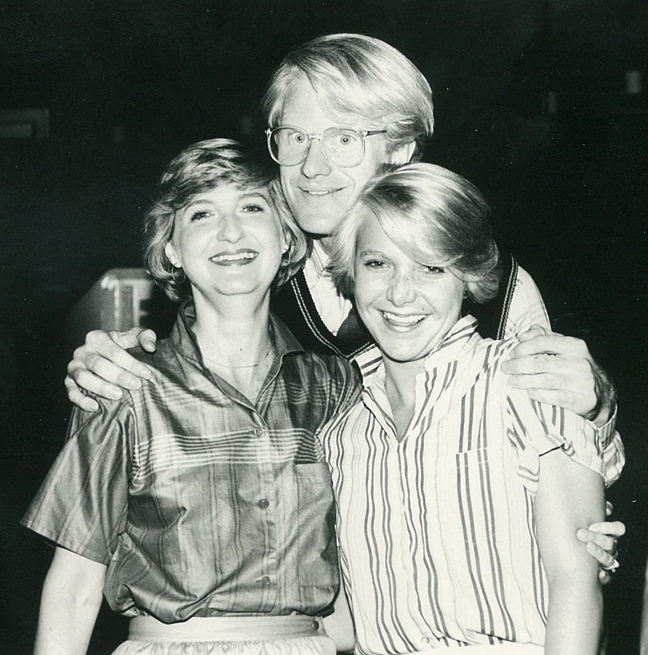 LoLo (as Production Coordinator), Ed Begley, Jr. and daughter, Kristin who’s showing how she can be his blond hair stand-in. Movie: Translyvania 6-5000: Zagreb, Yugoslavia, 1984. Tom, the Bandleader, takes musical requests from Jeff Goldblum (Jack) and Teresa Ganzel (Elizabeth) in the movie, Transylvania 6-5000. Zagreb, Yugoslavia, 1984. 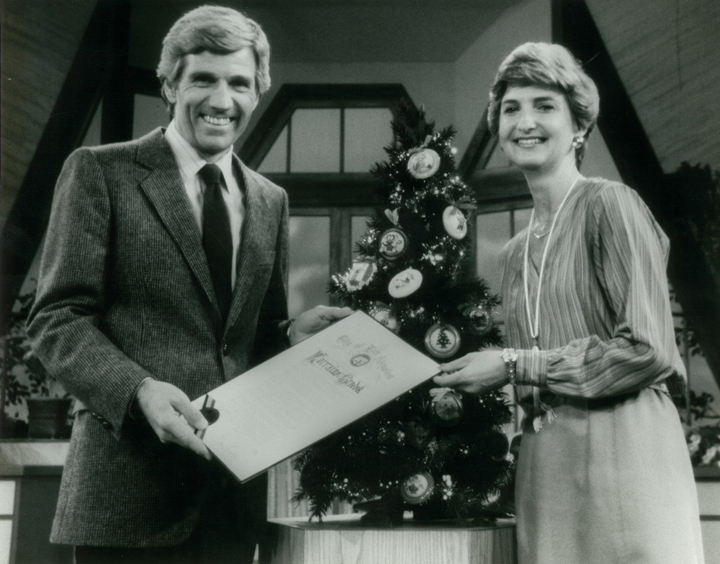 OPEN HOUSE, talk show host, Gary Collins presents City of Los Angeles’ Mayor’s Award to me in 1981. My Fingerprints’ Christmas ornaments decorate the Christmas tree in the background. 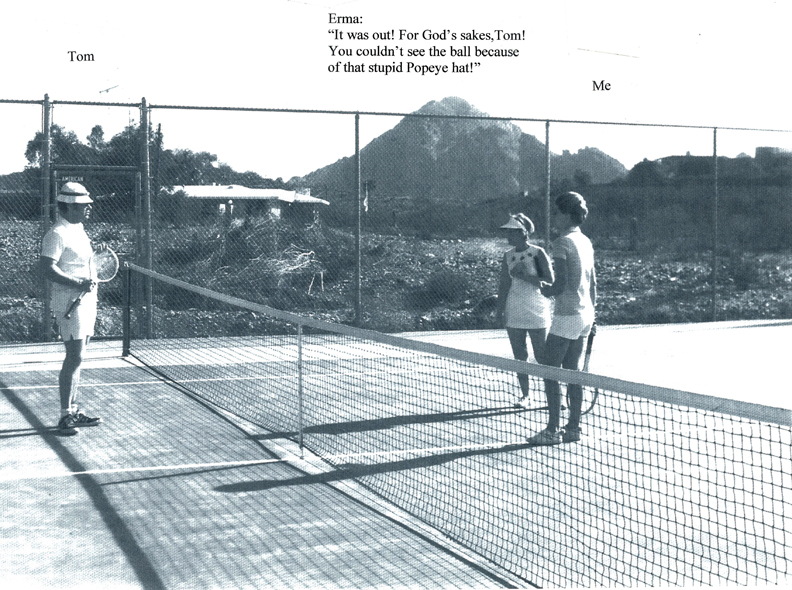 A little game of tennis on the Bombeck court in Paradise Valley, Arizona; 1973. Erma’s husband, Bill was Tom’s partner, but he stopped play to grab a beer and a camera. Score: Erma and me: 6-0; 6-0. 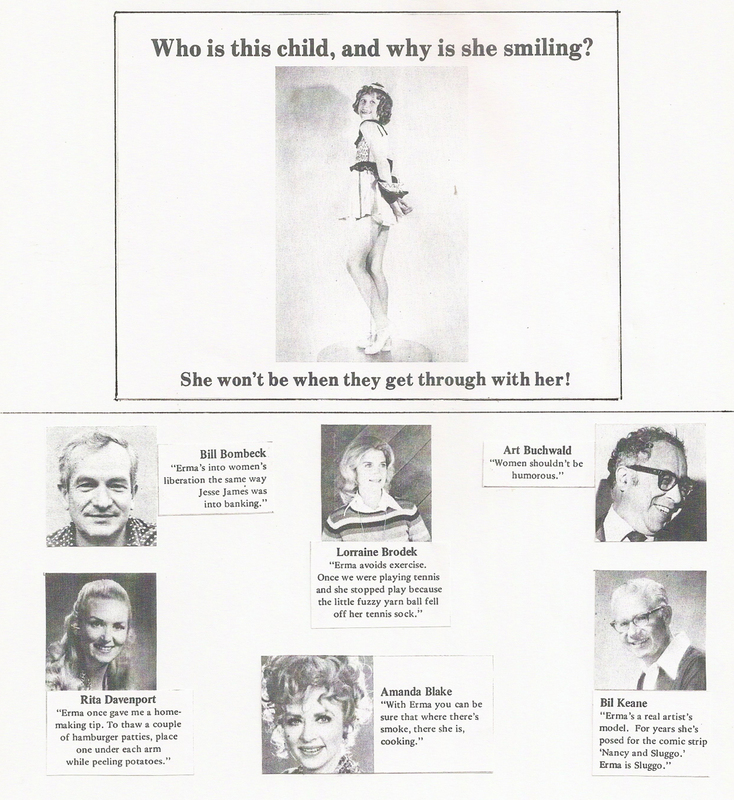 Erma Bombeck’s “Roasted Mother of the Year” Event, Mother’s Day, May 9, 1975. At the Mountain Shadows Resort in Scottsdale, Arizona, I was privileged to be a roaster among the funny and famous to raise major funds for the Arizona Kidney Foundation—Erma’s #1 Charity. Polycystic kidney disease eventually took her life in 1996 and also was the cause of successful transplants for her sons, Andy and Matt who inherited this awful disease.